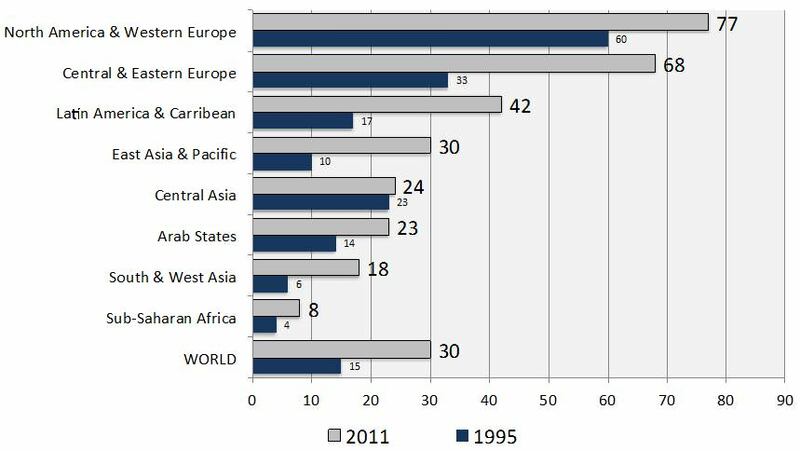 The global gross tertiary enrolment ratio (GTER) – that is, the percentage of the tertiary-aged population actually enrolled in higher education – has more than doubled over the past 20 years, growing from 14% in 1992 to 32% in 2012. This compares to an increase of just 4% in the 20 years before 1992. Much of this growth, as the following chart reflects, has been driven by growing participation in Central and Eastern Europe, Latin America, and East Asia. The researcher behind the chart, Dr Simon Marginson, a professor of international higher education at the University College London Institute of Education, noted at a recent Society for Research into Higher Education conference that 54 countries had a GTER of 50% or higher as of 2012, whereas only five countries were above that benchmark in 1992. It is easy to lose sight of the fact that this is nothing short of a reconceptualisation (and a relatively recent one at that) of what higher education is and what it represents for students, families, and society as a whole. Professor Marginson is part of a group of higher education scholars from nine countries that began collaborating in 2013 on a series of academic papers that will explore this dramatic growth in higher education participation. The first of these papers will be published shortly but early results have been presented at conferences over the past few months and the findings carry some important implications for international student recruiters. For one, the research coming from Dr Marginson’s group raises some questions about the link between economic growth and growth in higher education participation. It suggests that expansion of higher education systems is often independent of economic growth rates in a given country. “While economic demand fosters expansion of student places in particular fields short of labour (e.g. mining engineers in a mining boom), there is no clear evidence economic demand consistently drives participation growth,” he says. There has of course been considerable discussion in recent years about the links between employability and higher education, and no doubt economic conditions do bear on domestic and international demand in the short-term. But Dr Marginson takes a longer view in describing the relationship between higher education and the economy as “incoherent,” in part because many graduates do not work in fields in which they are trained. He argues that students are nonetheless attracted to higher education in the belief that it will provide them with a better chance for more secure and rewarding careers throughout their working lives. In the more specific context of international student recruitment, this finding does not diminish the importance of post-graduation employment prospects as a major motivator for students and families. However, it does point to a broader aspiration at work that acts on both higher education participation rates at a societal level, as well as decision-making around education at the level of the individual student or family, and that is the desire to reach or maintain a middle-class lifestyle. Put another way, the research suggests that demand for higher education is less a function of government planning or the state of the world economy than it is of popular demand and of the persistent desire of people to live more comfortable, secure, and fulfilling lives. The massification of higher education that we referred to earlier both enables and reinforces this drive. Dr Marginson argues that once higher education participation rates pass that 50% threshold they will continue to grow. Tertiary education becomes virtually compulsory for a majority of students at that point as the costs of not pursuing further study, in the form of more limited social and career opportunities, become ever more apparent. He adds, “Remarkable though it may seem when we look at the numbers for Africa and South Asia, all post-school education systems are on track to eventually become High Participation Systems, systems enrolling more than half of the population. This level has already been achieved in much of Europe and East Asia, and parts of the Americas. While economic growth is one of the conditions for high participation, and economic factors shape the growth of graduate numbers in some specific fields, overall, student numbers are driven less by labour market demand than by social demand. This entry was posted in Africa, Asia, Australia/Oceania, Europe, Higher Education, Middle East, North America, Regions, Research, South & Central America and tagged transnational education, Southeast Asia, joint research, undergraduate admissions, college admissions.